Are you doing enough to make the world a better place? 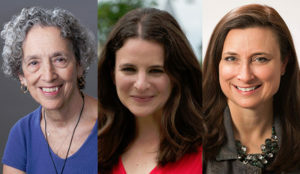 Explore this question as Dr. Erica Brown, director of the Mayberg Center for Jewish Education and Leadership at The George Washington University, speaks with Ruth Messinger, an iconic social justice activist and former president of the American Jewish World Service, and Sarah Hurwitz, the former chief speechwriter for First Lady Michelle Obama, about the intersections between Judaism, spirituality, and social justice. This is the Mayberg Center’s third annual “Conversations that Matter” forum. Messinger does international human rights work for AIDS Free World and serves as the inaugural Social Justice Fellow at the Jewish Theological Seminary of America. She is also the Social Justice Activist-in-Residence at the JCC of Manhattan. Hurwitz previously served as senior speechwriter for President Barack Obama and chief speechwriter for then-Senator Hillary Clinton during her 2008 presidential campaign. She is writing a book about the wisdom, insight, and inspiration she found when she began studying Judaism as an adult.